Yes, there are two paths you can go on. Luckily, there is still time to change the way you light the path, with path lighting from AffordableLamps.com. With conical, lantern, Zen garden, planter urn, and flora and fauna style fixtures, path lighting is the spice that illuminates your garden and yard. Arroyo Craftsman makes garden path lights and other outdoor pathway lighting to order, custom built to your specifications. Kichler lighting makes low voltage path lighting in so many varieties that you’ll never ever grow tired of gazing on their garden path lighting. And Hinkley Lighting specializes in nautical style path light fixtures and other affordable outdoor pathway lighting. Path lighting fixtures come in aluminum, copper, brass, and stainless steel, and regardless of what type of backyard you may have, there is a path fixture designed for your outdoor lighting needs and available at the best outdoor path lighting prices from Affordable Lamps. While garden paths can be pretty magical in and of themselves, why not jazz them up a little bit with some path lighting and garden path lights? Outdoor lighting takes many forms, but some of the most often overlooked are garden path lights. Like subtle fairies, landscape path lighting can create a uniquely delightful ambience along your home’s walkways and flowerbeds. Outdoor path lights are the perfect accompaniment to a wondrously beautiful evening outside. And this outdoor path lighting is available from us at discount landscape path lighting prices. Landscape path lighting comes in a wide variety of styles ranging from playfully whimsical and rustic (think giddy squirrels and majestic acorns) to purely geometric and minimalist, like modern contemporary lighting. Inexpensive landscape path lighting will complement any yard or garden, whether you choose one outdoor path light or several inexpensive garden path lights. Outdoor path lighting is offered in a plethora of finish styles, such as shiny copper, silver, black, and luxurious verdigris patina, to name a few. Ornate scrollwork, gazing balls, intricate latticework, and layered wrought iron are all options for the multi-faceted garden path lighting available through AffordableLamps.com. Just peruse our selection of the best outdoor path lighting to see all the affordable outdoor path light options for yourself. Path lights are the perfect and final accent to your gazebo, front porch, back deck, flower bed, and look wonderful on edges of sidewalks and steps. Plant some landscape lighting along a garden path to accentuate your lush foliage or fountains. The landscape path lighting possibilities are endless. When Robert Frost wrote about two roads diverging in a yellow wood, he left out the part about the marvelous path lights mesmerizing him with their beauty. 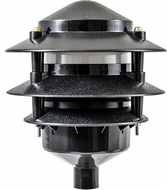 Fortunately for our customers, you don’t have to choose only one road, because at AffordableLamps.com, we have an almost infinite variety of path light styles to choose from. Don't settle for the limited selection of cheap path lighting at your neighborhood home and garden warehouse; take advantage of our wide selection of reasonably priced outdoor lighting options. Path lights have also evolved with the times, just like technology. No longer are we forced to light the outdoors with gas lamps or oil lamps. For those looking to illuminate their landscapes with environmentally friendly, sustainable furnishings, there are many options in the outdoor path lighting area as well. Low voltage path lights are becoming a top priority among landscape designers and there are certainly plenty of modern designs that satisfy this requirement and make it easy for you to buy outdoor path lights that you will love from our garden path lighting sale. Consider purchasing an energy saving path light that uses fluorescent, halogen, or super-efficient LED path lighting technologies from our outdoor path lights sale. This way, you will brighten up your garden from all possible directions, save some moola on your energy bill, and lend a helping, eco-friendly hand to our planet too with each outdoor path light. Our low voltage path lighting presents every kind of opportunity for artistic expression—you just have to browse this site and find the LED path lights that match your personality and style. Then, buy outdoor pathway lighting from us and have it delivered quickly and affordably to your front door.